These two minerals are extreme members of isomorphous row (on a photo - crystals of descloizite, basic vanadium ore). They meet as pyramidal or prismatic crystals, often in subparallel accretions; sometimes as brushes, concretions, dense the masses with a fibred structure and bud-like surface. Chemical composition (chemistry, compound). Oxide of lead (Rbo) 56,48%, oxide of zinc (ZNO) 16,60%, five-oxide of vanadium (V2O5) 22,74%, water (N2O) 2,34%; admixtures: copper, iron, arsenic. Transparency. Mat translucent (almost opaque). Class of symmetry. Rhombo-tetrahedral - 222. Form of crystalline excretions. Botryoidal, radially-radiant. 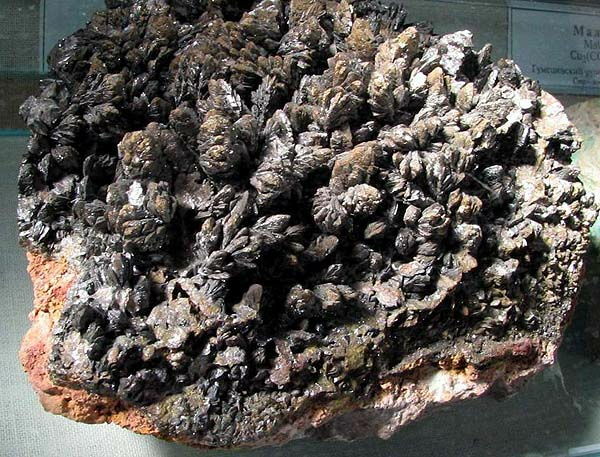 Descloisite is a vanadate of lead and zinc, usually with the admixture of copper. Glance (glitter, glare) fat or diamond. Colors: brown, red-brown, black. A line is yellow to light-brown. Fracture, break padman. Fragile. Cleavage non-existent. Appears in the area of oxidization of multimetallic complex ore deposits. Crystals (rhombic Crystal structure) columnar, basaltiform, pyramidal, lamellar tabular, also botryoidal aggregates. 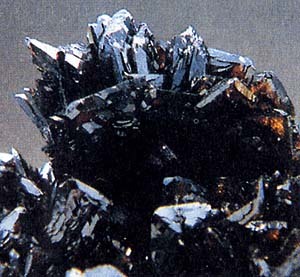 Source of passing receipt preparation of vanadium. Be found in the deposits of Karintii (Austria), in Cumebe (Namibia), Zimbabwe, region Shaba (Zaire), Algeria, state Arizona (USA). Colors hesitates from rose-brown to brown-black. Mottramite differs that can be also grass-green and olive-green. Glance (glitter, glare) fat. Brown, brown-green, brown-black. Soluble in acids; easily dissolve in water. Appear in the area of oxidization of some deposits of lead, zinc and copper; often associated with a vanadinite, pyromorphite, миметитом, by a cerussite. Both minerals are in many deposits. Mottramite was set first in Mottrem-Sent- Andrew in a county Cheshir (England). If these minerals are in an enough body, they are used as ore on vanadium. Concomitant minerals. Quartz, Limonite, Pyromorfite, vanadinite. Important vanadium ore.
Mottramite. Abenab, near Cumeba, Namibia. A photo: © A.A. Evseev.